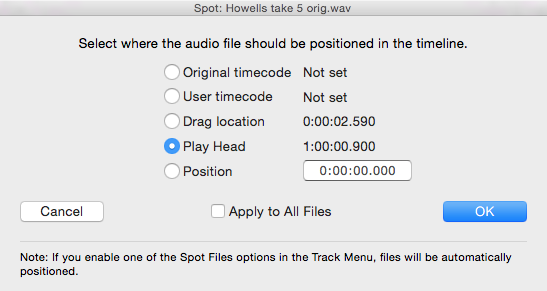 If dragged waveforms have a timecode stamp, and Auto Spot options described above are turned off, a window (shown right) will open showing the file name and timecode start and ask if you want to place the waveform start at the original timecode, the user timecode, at the play head, at the drag location, or at a specific position entered in the box. AUTO Track Naming. The first time you drag an audio file into a track, that track will be given the file's name. This can save much time labelling tracks. Each Revoice Pro session's sampling rate and resolution (bits per sample) are set and fixed automatically to the settings of the first audio signal imported into the session. After that, Revoice Pro will offer to resample any non-matching audio file that is imported, to match that session's sampling rate and resolution. 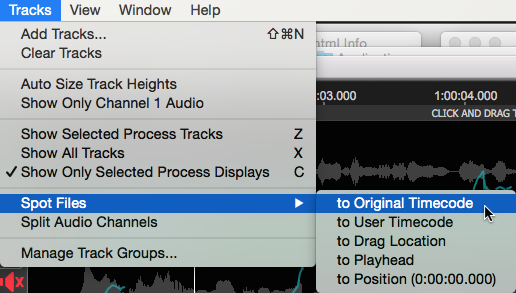 If the audio to be loaded is a multichannel file, channels can be split into individual mono tracks by selecting Split Audio Channels in the Tracks menu shown below. For multichannel audio files, selecting Show Only Channel 1 Audio in the Tracks menu only displays audio waveforms from Channel 1 of the file. This defaults to OFF.